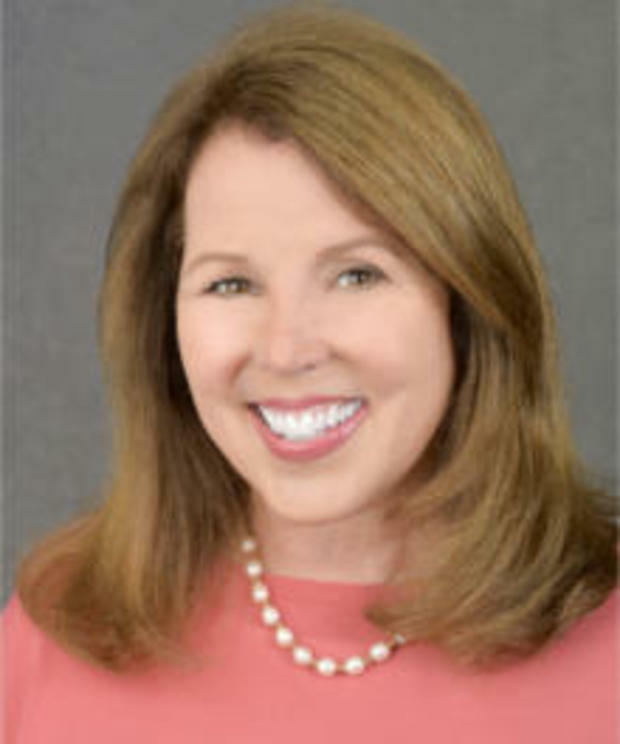 Who’s Behind the Voice at CBS Radio News? Wonder what the newsperson looks like? Does the voice match the face? CBS RadioNews anchors Gary Nunn, Wendy Gillette, and Allison Keyes are familiar voices to KJIM Radio listeners. As the only radio station in Texoma with hourly national and international news, CBS Radio News is a popular part of the radio station’s programming. People depend on it. Top Row, Left to Right: Jim Chenevey, Correspondent; Pam Coulter, Correspondent; Wendy Gillette, Anchor Middle Row, Left to Right: Steve Kathan. Correspondent; Allison Keyes, Anchor/Reporter; Sam Litzinger, Correspondent Bottom Row, Left to Right: Gary Nunn, Anchor; Deborah Rodriquez, Correspondent; Jim Taylor, Correspondent. 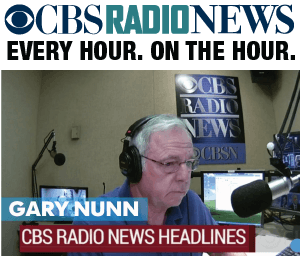 Visit CBS Radio News to see more face with familiar voices. On Thursday, December 18, 1947, on page 16 of the Sherman Democrat newspaper, a new radio heralded its beginnings in a full-page advertisement with the headline: "Here Is An Event for Which You Have Long Been Waiting." 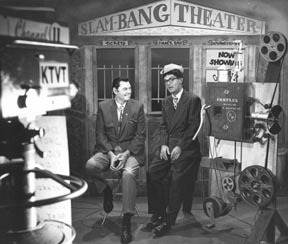 The owners, Joe Carroll and Elmer Scarborough, were proud of their investment, even though they sold the station just a year later. 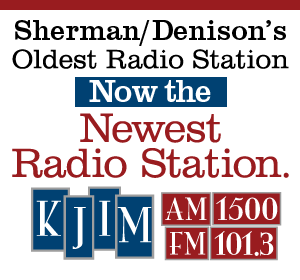 Otis McKenzie was announced as station manager of the new radio station in Sherman. McKenzie was already known in the area for his work at KRRV-AM, also licensed to the town. 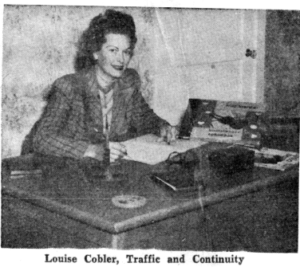 In the front office, Louise Cobler as program/traffic manager, commercial writer and program producer. Sue Hill was the station's accountant, receptionist and stenographer. Remember this was 70-plus years ago. Bill Collins was named staff announcer and music librarian; Bill Jaco, production manager and part time announcer; Stafford Davis and Paul Phillips handled technical duties and keep the equipment operating. "Nothing has been spared to make your new Radio Station one of the finest of its kind on the air." The program schedule noted that 1500-AM would present a full-day's offering. As a daytime broadcast station, that meant from 7:30 am until sunset each day. And while a listing of programs was printed, the ad also warned that "This is the program that will be followed for the time being. Changes will be announced in the Democrat as they occur." Although the station will offer a large variety of carefully selected programs, its music will be principally of the recoded type which is universally accepted as the finest sort to be had." 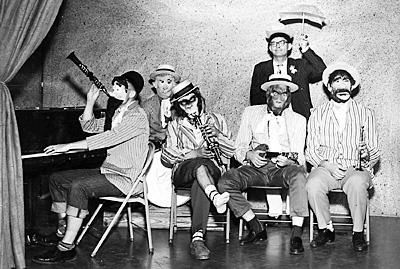 Monday through Saturday, morning began with "An Ear for Corn," followed by "Time Out for Sports," at noon the "Farm to Market Report," then later in the day "Adventures in Jazz," then ending the day at 4:35 pm with 40 minutes of "Campus Classics." The radio station was proud of its record library. Shelves loaded with mostly 78-RPM discs and a few transcriptions discs. 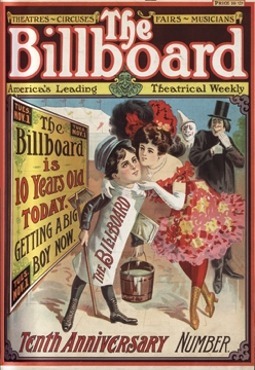 The first long-play album did not arrive on the scene until the next year, in 1948. Transcription discs were huge—16-inches in diameter—compared to the 12-inch that we know as a 33 1/3-RPM LP. The ad in the Sherman Democrat boasted "More than 5,000 records are included in our Record Library which will open up to you a vast field of entertainment from the finest artists on earth." Grayson County was created from Fannin County by the Texas State Legislature on March 17, 1846, just over 100 years before 1500-AM went on the air that December. The county's population was at 70,000-plus in 1947, Sherman counted just under 20,000, and Denison tallied approximately 17,000 residents. For a growing population, the radio station joined others that were already serving the community. 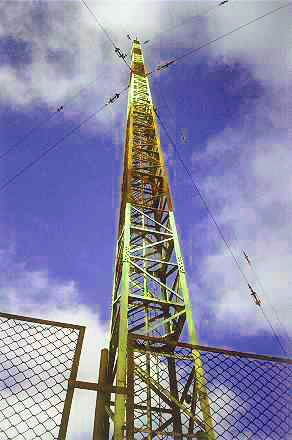 The FM antenna is mounted atop a tower that rises 370-feet above ground. Since December 9, 1947, 1500 AM has been broadcasting on the AM radio dial, in one form or another. 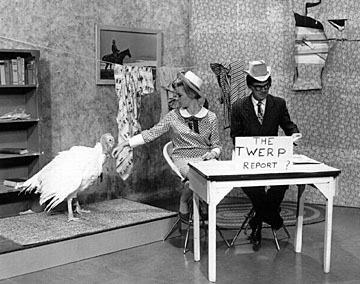 It was Sherman’s first commercial broadcast station. Its original programming was classical music and the radio station, over the years, offered a variety of formats. 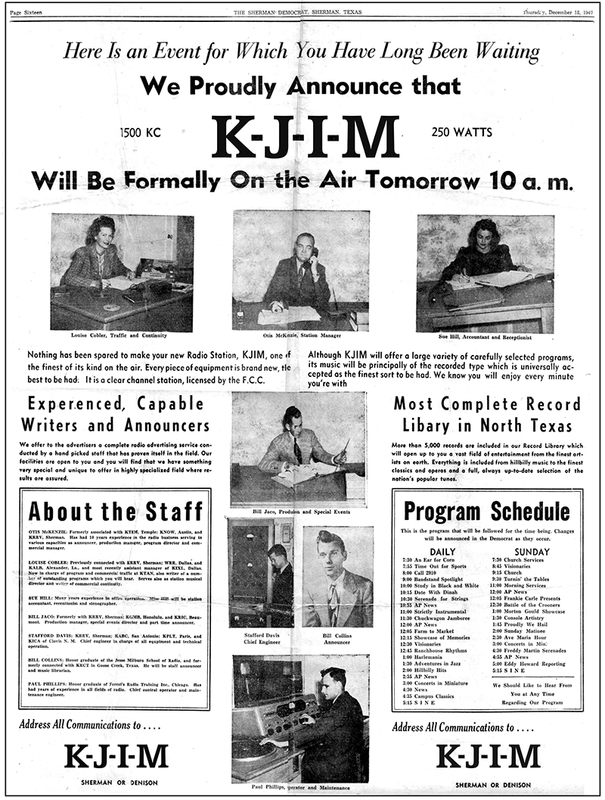 Now, 70 years later, KJIM-AM’s sister station KJIM-FM, is the area’s newest radio station at 101.3 on the dial. 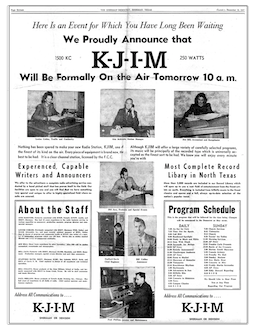 KJIM-AM’s signal can be heard across North Texas and Southern Oklahoma. The new FM signal at 101.3 covers a 40-mile radius from its 370-ft tower in Denison on Texoma Parkway just north FM 691. 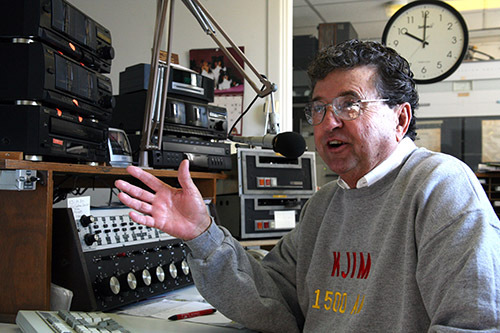 KJIM-AM and FM are owned and operated by Bob Allen. He bought KJIM-AM in 1995, and invested time and money improving the facility’s technical standards and experimenting with different programming formats. In the end, he settled on an eclectic mix of popular music from the charts as far back as the 1950s. That “nostalgia” format, that Allen dubbed “The Memory Maker,” has successfully attracted a loyal adult audience for over 20 years. “I always dreamed of owning my own radio station. In fact, as a child spending summers at our family’s vacation home on Lake Texoma in the 1950s, I listened to 1500 AM when we were on the lake. Who could imagine that one day I would own it,” said Allen. “I always dreamed of owning my own radio station." For Bob Allen, running his radio stations is more than a full-time job. His day starts at 2:30 a.m. and ends most days about 8:00 p.m. The schedule is 7 days a week and requires him to be on the air more than 5 hours each day. “My biggest job—and greatest pleasure—is preparing and reading the news. I am proud of the fact my radio station concentrates on local news, local events, and supporting the many projects of non-profit organizations in the community,” said Allen. KJIM has the most locally-produced news and weather on the local radio dial, with newscasts at 6:45 a.m., 7:45 a.m., 8:45 a.m. and 11:45 a.m. He also supervises the extended news broadcast from CBS Radio at 5:00 p.m.
Getting a license for a FM radio signal in a market the size of Texoma is difficult. New allocations for FM frequencies are rare. There are few available channels on the dial in a growing area like Grayson County, particularly when it is adjacent to a major metropolitan area. Allen got his latest license because of a landmark ruling in 2015, by the Federal Communication Commission (FCC) titled The AM Revitalization Act. The act allows AM broadcast radio stations that are limited to daytime service to apply for an additional license to simulcast its AM programming on a low-power FM channel if one is available. Since 1947, 1500-AM has been limited to operating during daytime hours only, with 1,000 watts of power. Allen’s application for the FM station was filed in 2016. Allen’s application for the FM station was filed over a year ago, shortly after the government announced that the revitalization ruling was in effect. “I know that I was one of the first group of independent broadcasters to request the add-on signal, and in the scheme of things, it is probably one of the fastest turnarounds I have experienced with the FCC,” said Allen. Bob Allen, has been in the radio business since the 1950s when he was hired at age 16 as a disc jockey at KTOK-AM, Oklahoma City. Still in high school, Allen admits he was fortunate to enter the radio industry at a time of major change in how radio stations were programming. 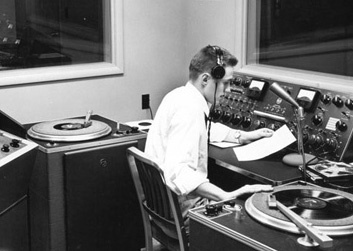 A typical 1950s-era radio station studio. The idea of playing rock ‘n’ roll records exclusively was a radical concept when Allen began his career. “Pioneers like Todd Storz in Omaha and Gordon McLendon in Dallas were beginning to experiment with a top-40 format that played a short list of hit songs, mixed with personalities, heavy on-air promotion and contests, and a much faster pace overall,” Allen recalls. The idea of playing rock ‘n’ roll records exclusively was a radical concept when Allen began his career. Three years into his radio career, Allen began to hear rumors about a revolutionary format that would appeal to the millions of baby boomers entering their teen years. Over the next few years, Allen moved from one station to another in the growing Oklahoma City market making a name for himself as a reliable employee with a dynamic personality that attracted young listeners. He learned the ins-and-outs, ups-and-downs of a competitive industry and he managed to stay on top of the ratings and always moving forward. But not everything worked out as expected. 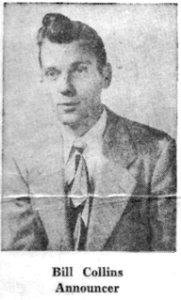 In 1961, Bob Allen accepted a job at KRMG-AM, Tulsa, Oklahoma. It was a dream come true for the young man who had grown up listening to the powerful radio station and thinking that one day, he would sit in that studio and play records for an audience that covered most of Oklahoma and parts of Texas. But, not all dreams unfold as expected. Just as Allen moved to Tulsa, the radio station changed its programming and moved away from its Top 40 format. “Instead of playing Chuck Berry records, I was now playing The Mills Brothers and Patti Page. It wasn’t the dream scenario I imagined,” Allen remembers. Allen did his time in Tulsa, but at the first opportunity returned to Oklahoma City and KTOK-AM to lick his wounds and regain his confidence. “As lucky as my life has been, the KRMG-AM episode was devastating and it took me a while to get back on my feet,” said Allen. Reestablishing himself in the Oklahoma City market and with his now-honed skills in the emerging Top 40 format, Bob Allen found his career back on track. Then, KXOL-AM in Fort Worth came calling. KXOL-AM was owned by Wendell Mayes, Sr., another broadcast pioneer, who Allen admired. “As nervous as I was, with a wife and three kids, it felt like an opportunity I could not pass up. After much back and forth, they agreed to pay me more money than I had ever made and pay for my move. A week later I was on the air in Fort Worth,” said Allen. Today, Allen credits the move to Fort Worth as a life-changing event. Today, Allen credits the move to Fort Worth as a life-changing event. It was there he proved his talent and learned how to navigate the complex world of corporate broadcasting. And it was there that he realized the real money to be made was in sales. “KFJZ-AM was looking for a sales representative and it was time for me to make a move,” recalls Allen. Over the next few years, Allen excelled in his new position and built a strong advertiser base for the radio station. Later, Allen started a small advertising agency and signed clients like Tandy Corporation’s RadioShack, ColorTile, and the McDavid automotive dealerships. It was for the McDavid family that Allen built the Widetrack brand. It was Allen’s pet Great Dane that played the role of Widetrack and became a star on Dallas-Fort Worth television with commercials Bob Allen wrote and produced. Still building on a 60-plus year career in media, Bob Allen is still enthusiastic about his life’s work. “How lucky am I, to have had a successful run on radio and television, and now my own radio stations, where I can program exactly the music, news, and features that please me?” asks Allen. Early to bed. Very, very, early to rise makes Bob Allen a happy man.